If you skipped out on the 2016 Country Music Association Awards because you're not the biggest country music fan, you seriously missed out. The awards show featured some great performances and appearances from celebrities from many different genres, resulting in some excellent mash-ups. A great example of this was Beyonce performing "Daddy Lessons" with The Dixie Chicks on Wednesday night, embracing her Texas roots by adding a country feel to the Lemonade song. 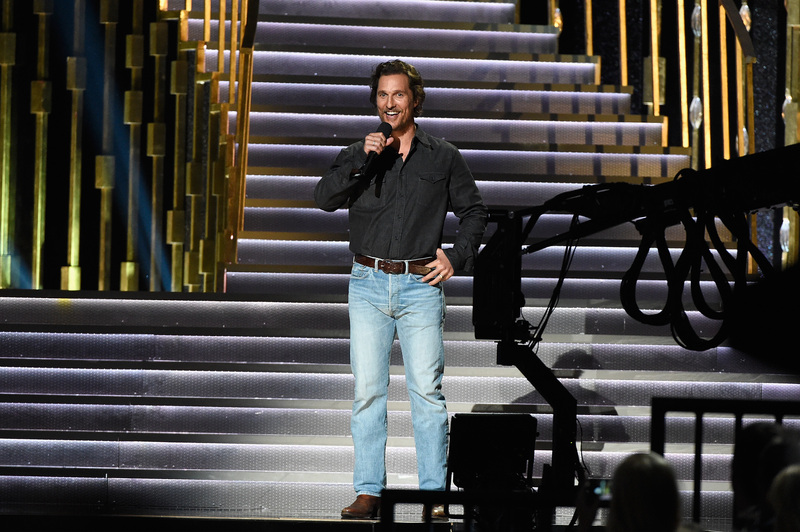 And in another example of celebrities from every walk of life joining in on the country fun, Matthew McConaughey danced to Beyonce in the CMAs audience, and seeing his familiar moves was reason enough to tune in. The camera caught McConaughey, who presented an award earlier in the night, dancing to the performance alongside his wife, Camila Alves. While she was clapping along the beat, McConaughey was beating his chest to the music, a move that should've immediately been familiar to anyone who saw The Wolf of Street. You can check out McConaughey dancing to "Daddy Lessons" in Us Weekly's tweet below and see if it jogs your memory. If you think this dance is an instance of life imitating art, you actually have it backwards. In an interview with The Graham Norton Show, McConaughey said that he actually beats his chest like that to relax before for scenes, and after Wolf of Wall Street co-star Leonardo DiCaprio saw it, suggested that he try it on camera. "And I was doing it before the scene and then I'd start the scene. We do five takes. I'm happy; Martin's happy," he said. "We're about to move on, and before we moved on, Leonardo raised his hand and said, 'Hang on a second. What's that thing you were doing before the scene?' And I told him, and he said, 'What if you put that in the scene.' I was like, 'Yeah, great.'" And apparently, in addition to relaxing, McConaughey breaks out that chest-beating move when he's listening to Beyoncé.